Knaresborough Town suffered a second successive defeat to one of their title rivals, going down 2-1 at home to Yorkshire Amateur. 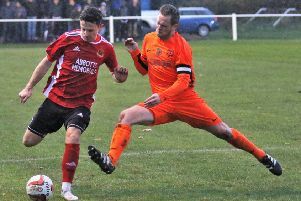 Paul Stansfield's men, third in the NCEL Premier Division standings, were edged out by second-placed Penistone Church last time out and failed to recover from falling two goals behind when they entertained the league leaders on Saturday. 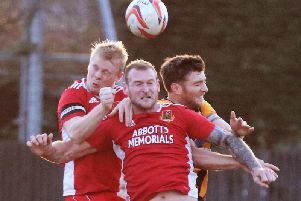 An early Ben Cohen effort was easily saved by Graham McLachlan in the Ammers' goal, but it was the visitors who went ahead after six minutes after the Boro defence failed to clear a bouncing ball and Brice Tiani headed home. Cohen then fired over after a Nick Black flick from a Greg Kidd throw-in, but play soon switched to the other end of the field where home custodian Jack Rushworth saved from Ashley Flynn. Rushworth comfortably dealt with Matthew Dempsey’s free-kick early on in the second half, while another Cohen effort was stopped by McLachlan before Amateur got a second in the 51st minute. Flynn back-heeled a cross from the left into the path of Tiani and he managed to reach the ball before the diving Rushworth, striking home from a narrow angle. Town were shaken into action and Black was wide from Cohen’s centre before Will Lenehan headed his first goal of the season from Rob Worrall’s right-wing corner, dragging his side back into the contest in the 55th minute. Three minutes later, a Brad Walker pass found Rob Youhill in space, but his low shot was kept out by the legs of McLachlan. Worrall then saw a strike blocked and a further effort saved, while in between, Rushworth denied both Flynn and Harrison Blakey in the opposite penalty area. As Boro continued to press, Walker found space and fired towards goal, only to see McLachlan again up to the task, tipping the ball around his upright. Cohen and Luke Stewart both tried their luck late on, but neither were able to find the back of the net as the Ammers held out to open up a 12-point gap between themselves and their hosts, albeit having played three games more.